Last night I sat down and downloaded Statigram, the app that generates the “year in review” videos that are the most popular thing on Instagram right now. I gave the app my info and via my top ranked Instagram photos it generated the most disappointing narration of my year ever. In five crummy pictures my 2013 was summed up by two pictures of different girls with different dogs (I don’t like dogs), an image of a tree (I am not much of a nature person), a terrible photo of myself giving an interview to a news organization (embarrassing), and lastly an actual cool photo of fireworks going off in our arena. Needless to say, I was underwhelmed. After thinking about it for a couple minutes I decided that I was not going to let that corny video define my year, even just in an Instagram sense. Instead, I turned to Flipagram and merged together seventy of my happiest, coolest, and most memorable photos from 2013 into a fifteen second Instagram video set to a song that means a lot to me. It made me feel a lot better about how I was ending 2013 on my favorite social media service. 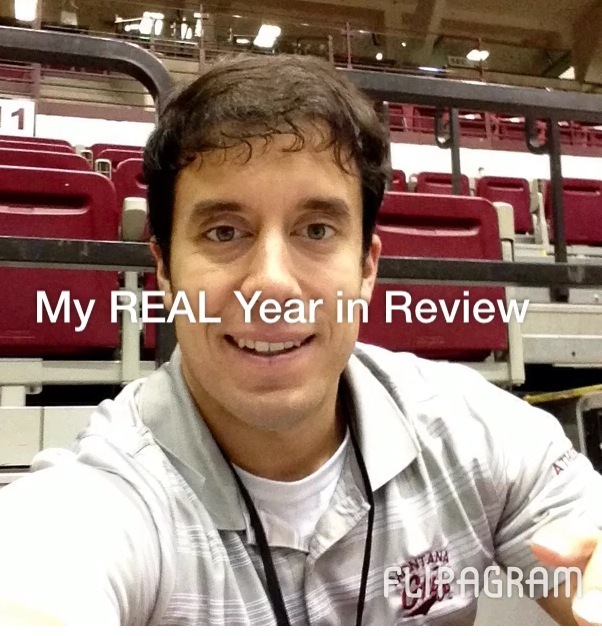 I made sure to make a deserving video for my Instagram year in review. The way I evaluated my year on a social media level corresponded to how I evaluated my year on a general level as well. In 2013 I came head-to-head with some disappointments. I lost out on a couple opportunities that I probably think about too much. I allocated too much of my time to some people and not enough to others. I had a few bad days. But in the same way that I allowed my Flipagram video to trounce my Statigram video, I have willingly let my good times in 2013 dramatically overshadow the subpar times. In 2013 I experienced a lot of joy. I laughed a lot. I made new friends. I woke up motivated and hungry every day. I grew as a person. My family had a safe and healthy year. I had a great twelve months working for Grizzly Athletics. I will remember March 16, 2013 for the rest of my life. 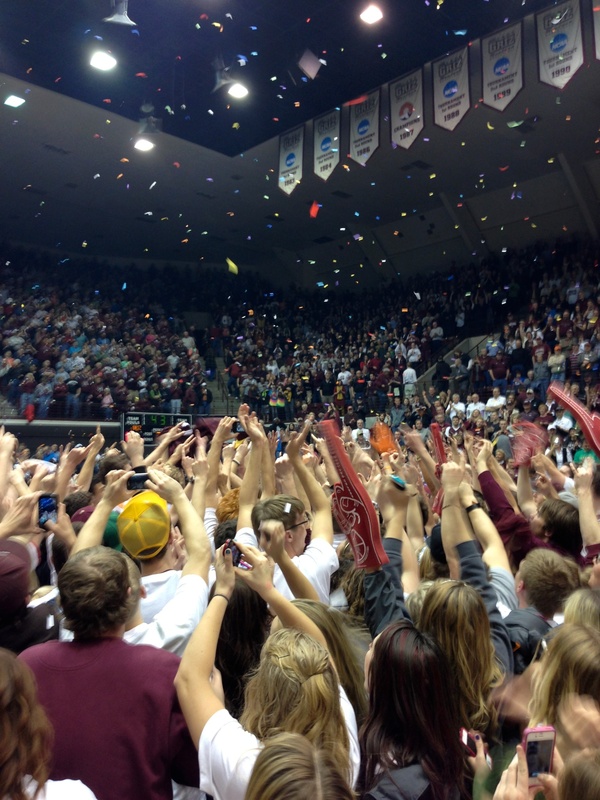 We sent both our basketball teams to the Big Dance under the same roof just a few hours apart. In 2013 I got to take some nice vacations in Boston, Las Vegas, and Orlando. I got to see a couple great concerts. I attended some pretty sweet professional sporting events. I dined at the nicest restaurant I have ever eaten at in my life. While these times were cool and are nice little notches in my 2013 belt, they don’t highlight my year. Rather, a day like July 5 where I spent a sun drenched, action packed day in Walla Walla, Washington, with my family mean more to me. Or the day of March 16 where both our men’s and women’s basketball teams punched tickets to the NCAA Tournament under the same roof just hours apart stick out more. Or the week I just experienced in Spokane where I got to put everything aside and just be myself around my loved ones will always scream “2013” more than any vacation or concert. 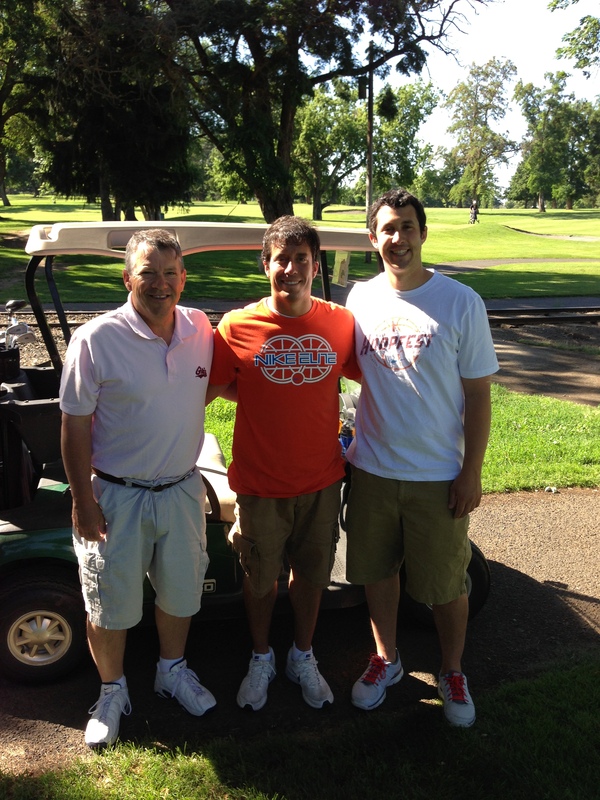 Quite possibly July 5 in Walla Walla with my family was my best day in 2013. If you find yourself sorrowing over 2013 try to think about the good things that did happen. Even those of us who had a truly rotten year can find a few positives. Try to focus on those moments until the clock hits midnight this evening. Then wipe the slate clean and pour 100% of your energy into making 2014 the best ever. Thank you for making 2013 a GREAT year for Don’t Blink. I wish all of you a very prosperous new year. Cherish every second of it. Don’t Blink. I did a good portion of my Christmas shopping on Christmas Eve this year. Mind you I did start early in the morning. By around 2 p.m. I had completed almost all of my shopping and I headed off to Northtown Mall (yes, that Northtown Mall) to meet my friend Jessie who also waited to the last second to purchase the remainder of her holiday gifts. With our shopping lists taken care of, we casually strolled around the mall taking in the last hour blitz. 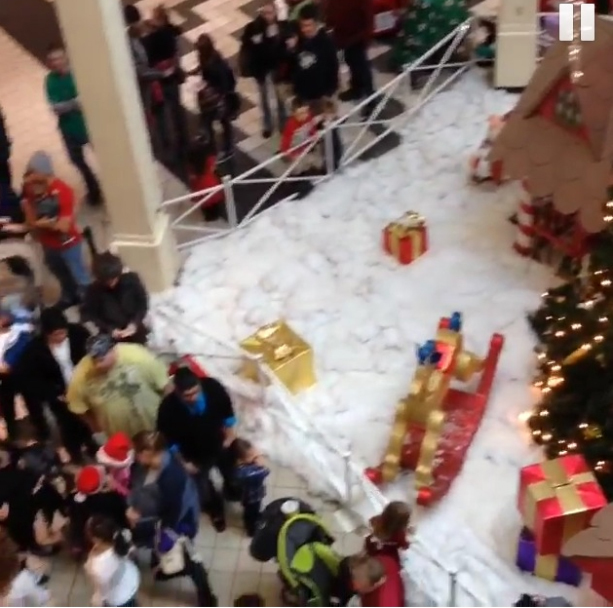 To be completely honest, the mall was not in a frenzy. Anarchy had not broken out. Rather, it seemed very tame and dense as we walked through the center. Of course there was one exception. We made our way to the upper level of the mall and looked over one of the balconies. We casted our eyes downward and caught a glimpse of what some may call a depressing sight. A line stretched completely around the large North Pole/100 foot Christmas tree display and down a significant stretch of the mall not even in the vicinity of the winter wonderland. Of course this windy, stretched line of adults and children existed because they wanted to get their picture taken with the Fat Guy. At the forefront of the North Pole display sat Santa Claus in his big red throne surrounded by a couple of photographers with those multi colored dust brushes. The line seemed to be moving at an agonizing slow rate. A small portion of the line. Sorry for the terrible quality. I had to capture it from an Instagram video. Excuse me, but why would all those people choose to get their picture taken with Santa on CHRISTMAS EVE and why would they insist on standing in that line when the wait was probably at the very least TWO HOURS? This was the point where everyone wanted to get to. Again, I apologize for the photo quality. Now I know you sense complete hypocrisy as I type out these words. I of course was out on Christmas Eve myself. I decided to procrastinate until the very last minute that ultimately led me to the exact same place that all of those people in line were. Yeah, I am not proud of myself. But I don’t think things are exactly the same. I got home well before festivities started. I never wasted any of my time standing idly in line. Why wouldn’t you get your family Christmas photo with Santa well in advance of Christmas Eve? Isn’t the point to show off and send out your photos to others before the new year actually hits? Or isn’t it the goal to let your children see Santa at the very least three weeks before Christmas so you have ample time to use leverage against them to be on their best behavior? Or wouldn’t you want to go earlier in the month so you can help perpetrate the myth of Santa Claus to your kids just a little more? I mean come on, most youngsters have the sense to realize that Santa can’t possibly afford to sit in the middle of a mall in Spokane, Washington, at 3 p.m. PT on Christmas Eve. But most of all, why would you want to spend multiple hours of your time in a line during the late hours of the afternoon on Christmas Eve? I guarantee that half of the poor souls I saw waiting to see Santa were still waiting in line while I attended Christmas Eve mass with my family. I don’t do well in lines. I definitely don’t do well in lines when I could be out celebrating one of the most joyous holidays on the calendar. 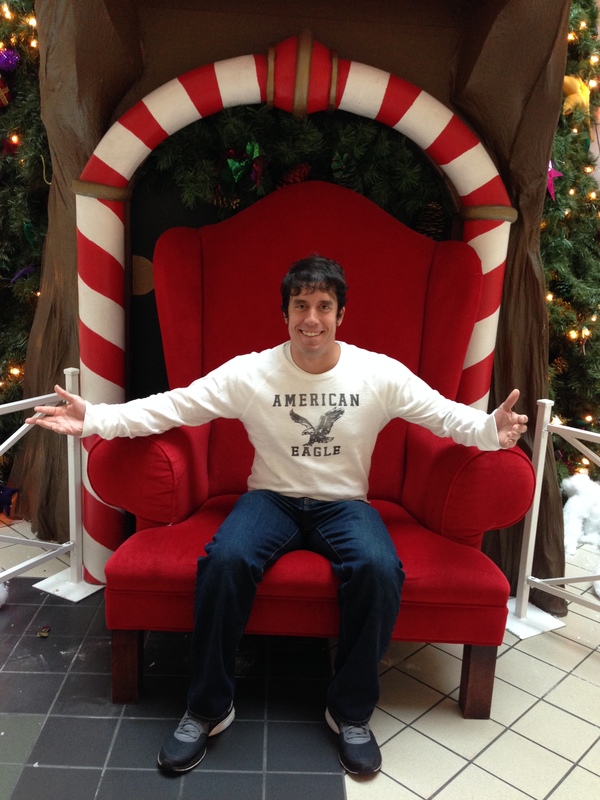 A couple days after Christmas I sat in Santa’s throne in Northtown Mall. However, I definitely know that I could be missing something. I mean heck, out of all the mall trips I took during the holiday season, nothing compared to the one I saw on Christmas Eve. 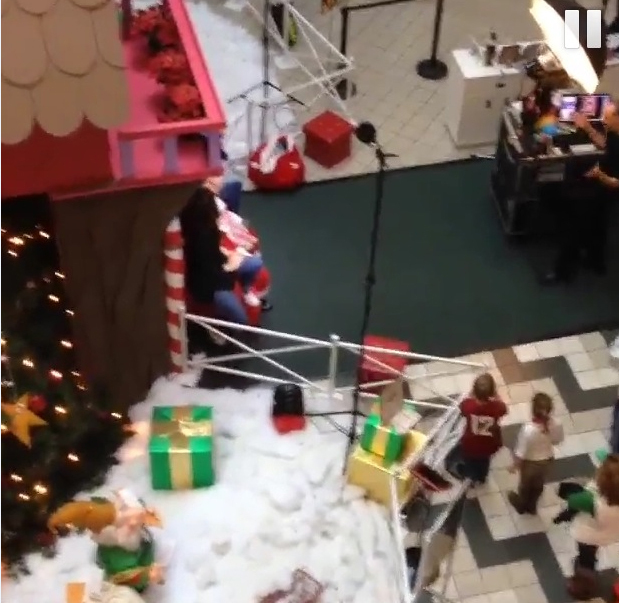 A reason must exist for why people freely sacrifice their holiday to stand around a cheaply manufactured holiday display in a halfway abandoned mall for hours on end…right? Is it because of tradition? Is it because of the magic? Is it because people want to stay away as long as they can before they have to go over to their relatives’ house? I know I am assuming a lot so if I am in fact way off and narrow minded please enlighten me. To each his own! I know I will probably hear some answers that will put me in my place. For all I know, Santa Claus might very well be real and he just so happens to take up residence at Northtown Mall while giving everyone who visits him on Christmas Eve lavish gifts and winning Mega Millions tickets. If so, I might find myself in line next year. Don’t Blink. As I sit here in my Missoula apartment fresh off of one full week in Spokane for the holidays, I feel very rejuvenated. Last Sunday I got in my car and drove west for a nice vacation in my hometown. Earlier today I made the trek back here. As with any fun and fulfilling getaway from the grind, time seemed to travel extremely fast and many memories were made. I was as jolly as St. Nick the whole time I was in Spokane. I am so incredibly thankful for how our schedule at work figured itself out this year. For both Thanksgiving and Christmas, we had no home athletic events around the two holidays. This allowed me to take extended breaks during the weeks of both holidays, something I had never gotten to do while working for Grizzly Athletics. In fact, I had never taken a whole week off from work ever, so to have that luxury was nice, relaxing, liberating, and even a little bit weird! But most importantly, it was so incredibly worth it. How did you spend most of your Christmas week? Well, I caught up with my family. Hours were spent in my parents’ living room around the Christmas tree and fire place. Even if we weren’t talking, you would still find all of us in that living room. My brother would be texting, my sister would be Snap Chatting, my mom would be playing Candy Crush, I would be on my phone, and my dad would be getting irritated. But trust me, we devoted more time to chatting than to playing with our electronics. How else did you spend your Christmas week? I ate. And I ate. And I ate some more. Of course the crowning moment of my week long feast came right in the middle of it with our Christmas dinner on Wednesday. My mom made an exquisite prime rib meal complete with pasta, mashed potatoes, corn casserole, and more. It was heavenly. But sandwiched between that were about 200,000 calories on both sides. Besides the constant snacking on Christmas treats around the house we made Spokane restaurants very happy with our patronage. I dined at Flamin’ Joes, Boiler Room, Hop Jacks, Waddell’s, Moon’s Mongolian Grill, Panda Express, and even Taco Bell. My mom also managed to make a chicken fettuccine dinner and her classic biscuits and gravy breakfast. Did I also mention that I took my first ever week long hiatus from working out since middle school? Yeah, tomorrow’s gym session should be great. Our Christmas dinner was amazing! Anything else besides chatting and eating? Well of course…I slept! Probably the main reason why I feel so rejuvenated is because I enjoyed some of the best sleep I have gotten in a long time. I haven’t known what “eight hours” was since I started college so to actually sleep from midnight to 8 a.m. most of the nights in Spokane felt amazing. It wasn’t like this was choppy sleep either. I slept like a baby in the guest room at my parents’ house and woke up energized and happy each morning. That’s all you did with your week off? Lame! Not so fast! I did have a little bit of fun. Besides my lovely family, I got to hang out with some of my friends. I enjoyed the company of my remaining friends from high school who still reside in Spokane. 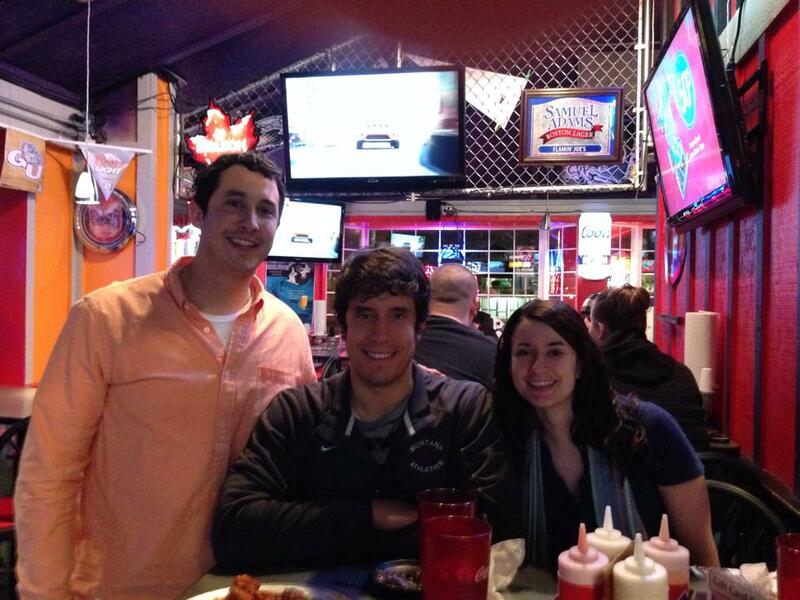 I got to hang with a couple friends who I met going to college who now work in Spokane. I got to enjoy lunch with a friend who I met in Missoula about a year and a half ago but has since moved away to Denver but was in Spokane for the holidays with her family just like me. I also got to hang a couple times with my good friend Jessie who I coincidently met on the Las Vegas strip a couple years back. She now lives in Seattle but her family is in Spokane. Kind of an uneventful week off, wouldn’t you say? Well, I guess so. But I neglected to mention the little things. You know, like playing Nintendo 64 with my brother. Or going to the meat market in a sketchy area of Spokane with my mom. Or playing with my sister’s adorable kitten. 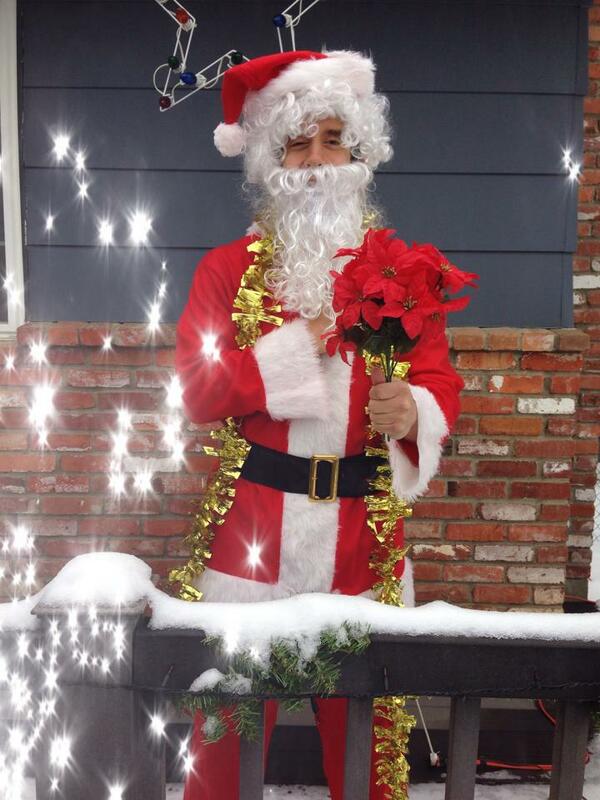 Or going up to a random stranger’s house in my Santa outfit and taking a picture in her lawn. Or going to see “American Hustle” and “Grudge Match”. Or watching football games with my dad and brother. Or walking into a zombie donut shop. Or attending a couple of beautiful church services. Or playing in a poker tournament. Or tying my brother in black light miniature golf. Or spending 60 tokens on arcade games. Or visiting my dad at work. Or driving around looking at Christmas lights. Or eating ice cream and watching a movie at home with my parents. Or just taking the time to realize that I do have a life outside of work. It was a very nice week with family and friends. This past week was just what the doctor ordered. I will remember Christmas 2013 for a long time, especially that feeling I had of complete freedom. It was all about family and friends, for the most part I didn’t let any stress into my life. I absolutely love what I do for a living but sometimes it is important to take a step back and celebrate what matters the most, especially during the best time of the year. Merry Christmas! Don’t Blink. Happy Holidays everyone! I hope you all had a blessed Christmas. Currently I am still in Spokane on vacation as I enjoy time with my family. Speaking of enjoying time with the family, when us Resers are together we like nothing more than to go to the movies. This holiday season has proved no different as I have watched two movies in two nights with my loved ones at the neighborhood theater. Writing as a movie critic is definitely not my forte and I am definitely not qualified to do it, so please consider the explanations below as just a brief guide from a biased male movie-goer. I want to just provide what I thought of the movie and maybe make your decision easier on if you want to see it or not. “American Hustle”: On Christmas evening my family winded down from the day’s festivities by watching “American Hustle”, a movie with a star loaded cast about a couple of con people who get caught conducting one of their schemes by a FBI agent during a sting. In order to avoid severe sentences, the con people (Christian Bale and Amy Adams) must participate in a much bigger, more elaborate sting operation orchestrated by the FBI agent (Bradley Cooper). “American Hustle” definitely has its slow parts. By no means was I hanging onto my seat wondering what would happen next. In fact, the ending is quite predictable. But, even though the movie is slow and even though it is predictable, the plot is still good. What sets this movie apart though is the acting. The performances put on by Cooper, Adams, and especially Bale, are superb. Jennifer Lawrence also plays a big role in the movie and provides stellar acting as well while also being very easy on the eyes. Robert Deniro also appears in the movie. I would recommend the movie to most adult audiences who want to watch a sophisticated crime drama containing the best acting talent available in 2013. My attention span is not always the best so many might not even think it was as slow as I made it out to be. “Grudge Match”: Yesterday my brother and I returned to the theater to watch a movie that he had anticipated the release of for quite some time. Starring Slyvester Stallone and Robert Deniro, “Grudge Match” chronicles the build up and bout of two aging rivals who last fought 30 years ago. The rivalry came to an abrupt halt before the rubber match of the series could be staged. However, with money and unfinished business playing a role, both fighters agree to put the gloves on for one last time and settle the rivalry for good. I actually really enjoyed this movie. I personally found Stallone and Deniro hilarious throughout the whole production. There is a great scene where the two make fun of mixed martial arts and another pretty good scene when the two parachute. Besides the funny scenes, the culminating boxing match scene is very good as well. The boxing itself is well done but the sportsmanship at the fight’s culmination is very heartwarming. Both of the men’s trainers, Alan Arkin for Stallone and Jon Bernthal for Deniro play solid roles. If you are anything like me, you will get very annoyed with Kevin Hart who serves as the over anxious promoter. I know there are a lot of Stallone haters out there so I definitely wouldn’t recommend this movie to those people. However, I would recommend “Grudge Match” to most others. It is an easy going movie with lots of laughs, a great ending, and two iconic actors bringing the best out of each other. Lately I have had bad luck with movies so it was refreshing to watch two movies in a row that I actually enjoyed. I hope that all of you get to the theater this holiday season and see something you like! Don’t Blink. Earlier this week the nation got wrapped up in the second biggest Mega Millions jackpot in history. With $636 million at stake, lottery fever infected many of my friends and family. No matter what I did, I couldn’t escape the constant media coverage about the outrageous amount of money up for grabs. I don’t play the lottery. I take one look at the 1 in 258.9 million odds and don’t even bother. I don’t need to be told the unrealistic, crazy, outlandish events that are more likely to happen to me than winning Mega Millions. That 1 in 258.9 million line stands alone. Enough said. Don’t be offended by me if you get excited by playing the lottery but I find games like Mega Millions incredibly boring. You purchase a ticket, let it collect dust for a couple days, and then check your phone or newspaper to see if you won. Many times the numbers you chose aren’t even in the same solar system as the winning numbers. Quite often, there isn’t even a winning ticket sold. Why try to win a prize when there is a good shot that the prize won’t even be awarded? I have people close to me who have defied the odds and actually won jackpots. My brother won a $25,000 jackpot on a card game (and managed to squander it all in about a year) and my great uncle once won a sizeable chunk of cash in a local and much smaller lottery game. But these events don’t entice me at all to play Mega Millions. I think with my brother and uncle already collecting on large sums of money and beating the odds, they have removed any and all chances that anyone in my bloodline will ever get lucky again. Besides, the odds that my brother and uncle overcame pale in comparison to what it would take to win Mega Millions. I am pretty sure that the chances are greater for them to win their respective jackpots fifteen more times in 2014 on the same fifteen days of that year than the chances are of ever producing the winning Mega Millions ticket. And by the way, my great uncle is dead. I don’t understand why people will wait in long lines for hours on end to purchase these tickets either. Or I don’t understand why people pull their hair out trying to come up with the numbers they will choose. Or I don’t understand why people throw away $100 on something that is less likely to happen than getting struck by lightning four different times in a day. You know what? I can live with that. I can understand that. To close your eyes and to think about winning that jackpot or to make the time go faster while traveling this holiday season and think about what you would do with $600+ million dollars is legitimate. It is a fun fantasy and a good way to escape. Even though I am still too cheap and realistic to fork over the cash for a ticket, I would say that the $1 price that people pay to dream is worth it. There are too many negative things in this world that we can allow to overtake our minds. Even though it is the long shot of all long shots, I can’t overly criticize something that gives someone else a little bit of relief from the rigors of life. Don’t Blink. Today it came to light that San Francisco 49ers fans raised over $9,000 to put up a billboard in downtown Seattle highlighting the team’s past Super Bowl success while reminding Seahawks fans of their lack of such success. This move by the fans of the 49ers came in response to an earlier stunt pulled by Seahawks fans where they paid to have a plane with a 12th Man banner fly over Candlestick Park before a San Francisco game. Seahawks fans also bought a commemorative brick at the new Niners stadium. Come on, what these fan bases are doing is over the top. It is childish. It is a waste. It is desperate. It is unsportsmanlike. It is GREAT. I don’t know if people on the other side of the country have taken notice or can feel it, but the Seattle Seahawks vs. San Francisco 49ers rivalry has blown up into a legitimate, big time, heated hate fest over just the course of a couple years. I don’t even live in Washington or California or even inside the route it takes to get from Seattle to San Francisco but I can definitely feel the intensity and disgust between the two sides. I guess I shouldn’t make myself out to be someone who is so disconnected from the rivalry. I have been a Seattle Seahawks fan my whole life. I am from Washington State. I have lots of friends who are Seahawks fans and who post about it on social media every single Sunday to remind me. I also have many friends who are San Francisco 49ers fans as well, especially quite a few who live here in Missoula. I guess my point was that even though I don’t live in a team’s territory or even though I don’t go to Seahawks or 49ers games or even though I don’t spend my free time coming up with clever memes to bash the other team, I can still feel the heat of the rivalry. 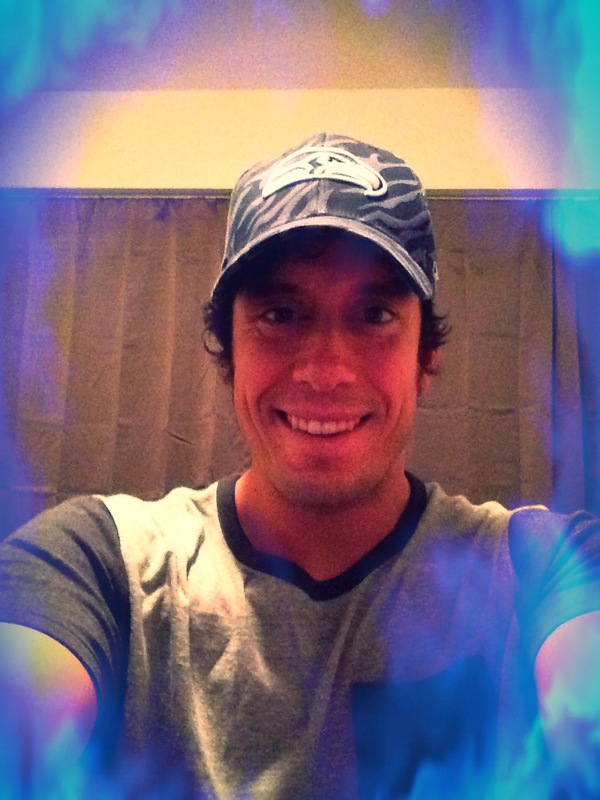 You bet I am a Seattle Seahawks fan! In my lifetime I haven’t seen a rivalry involving a Pacific Northwest professional team that has as much passion and venom as the Hawks-Niners. It is insane. It works perfectly though. Both teams are fantastic. Both teams are in the same division. Both teams hate each other. It also helps that each squad has a young, exciting, and superb quarterback leading the charge…quarterback debates about who is better always adds fuel to a rivalry. It is not necessarily a bad thing either that Jim Harbaugh is such a dislikable guy. You can always loathe a team more when the guy in charge is a jerk (not my words, just the opinion of your typical Seahawks super fan). Conversely, Niners fans have reason to wish nothing but bad things for an opposing fan base that pretty much thinks they are the best thing since sliced bread. Even if the rivalry is relatively new, there is no denying its existence as the most relevant and competitive one in the NFL right now. I love it that the players from the opposing teams genuinely despise each other and I love it that fans are going back and forth pulling off stunts to one up the other but there is one thing that turns me off a little bit about the rivalry: The way fans act on social media. I can’t believe all the nasty, low blow, classless things that both my friends who are Hawks fans and Niners fans post on Facebook about the opposing team. A week and a half ago when the two teams played I looked in shock at some of the repulsive things that were typed out and posted. If I took a screen shot of some of the stuff my friends put up and showed it to potential future employers they would never be hired again in their lives. Okay, I got to tell the truth: It really doesn’t bother me at all, I actually love all the social media back-and-forth!! Here’s to hoping that both teams remain good for many years to come and that this rivalry continues. It is just fun and good for both fan bases, especially the one in Seattle that has not seen a major professional sports championship since the 1970’s (exception for the Seattle Storm). Here’s also to hoping that the two teams meet in the playoffs and that the Seahawks kick the crap out of the 49ers…and that Jim Harbaugh cries. Don’t Blink. Although I am not a big fan of Oregon Ducks football, I do believe in the mantra of the team: Win the Day. Whereas I don’t apply this motto in a football sense as my playing days ended nine years ago, I do apply it in a professional and personal sense starting each morning when I get out of bed. I am a very positive person with an optimistic attitude on almost anything thrown my way so naturally I have far more good days than bad ones. If there was a scoreboard that kept track of the positive points of my day vs. the negative points of my day according to a football scoring system, you would routinely see scores favoring the positive side of 35-3, 42-10, and 28-7. However, about 30% of the time you would also see scores mixed in such as 28-24, 21-20, and 10-7. It is on these latter days where I have to fight a little harder to come out on top. Sometimes I will get to work and immediately a setback will occur. I will get an e-mail, a phone call, or complaint. Then something else will happen that I did not hope or plan for. Some people at this point will fold and announce that the day has been lost. While I do feel discouragement, I do my best to not give up on the day. I tell myself that the next several hours will not be as easy as usual and that I will probably experience additional setbacks but that the day can still be won. But, you might ask, how do you win the day when not very good things have already occurred, when you know you will have to deal with the aftermath, and when you sense that further things could go wrong? What can you do to salvage the day? First, I make sure I have a positive attitude. This means believing that even though more negative things could present themselves, a greater number of positive things will wash them out. It also means carrying myself with positivity and reflecting it onto others as well. The way you treat others will bounce back at you. If you treat people in a positive manner, you will have more positive vibes sent your way. If you treat others in a negative manner, you will have negative vibes sent your way. Salvaging a tough day for me also means taking initiative and getting ahead. If I am dejected about something that happened, I will get myself back on track by doing all I can to rectify the situation. If it is something out of my control, I try to move on to a different task, one that maybe is important or that goes above and beyond my assigned duties. Completing something like this helps to overshadow a less significant episode that went wrong and it sends the momentum back in my favor. I don’t just try to hit homeruns, however. I also notice and appreciate small victories. If I get a compliment, a “thank you” from a student-athlete, or a friendly visitor to my office I consider them all as little things that can help turn a not so great day into a good one. Just as an example from today, I received a small Christmas gift from our associate athletic director. It gave me a much needed boost instantly. 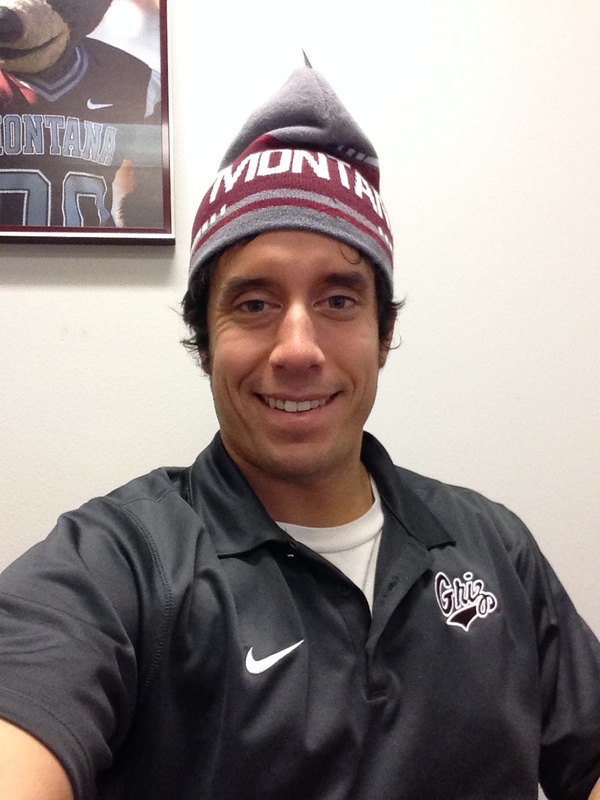 I considered getting this Griz beanie Christmas present from our Associate AD as a small victory. Bottom line, on some days we have to battle. Good days aren’t always easy to achieve and sometimes it seems like the answer is to just accept a seemingly unavoidable bad day. But if no one died and if no one got fired, I really do think we all have the capability to turn bad days into good days. The key is to just stay positive, get ahead, and relish the small victories. Our motivation should be at the end of the day to walk out of the office in a triumphant and confident swagger rather than a slow walk of defeat. Good or bad day? It is entirely up to each one of us. Don’t Blink. I admittedly don’t remember much from when I was eight years old. For that matter, I don’t remember that much from when I was seven or nine years old either. But with pretty much every person, there are certain moments from childhood that stick with us forever. Christmas Eve of 1994 provided me with one of those moments. 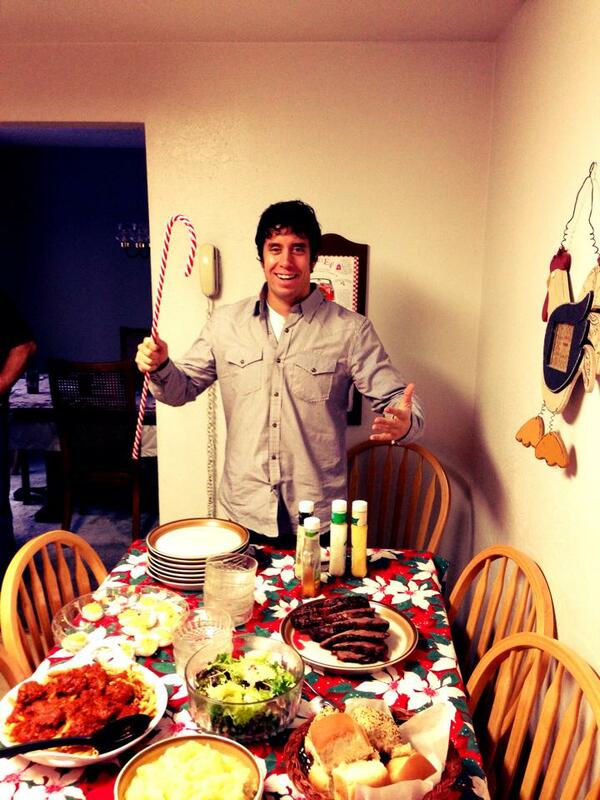 My family would always spend the Christmas holidays in my parents’ hometown of Walla Walla, Washington. We would spend Christmas Eve with my dad’s side of the family and then spend Christmas Day with my mom’s side. The celebration at my dad’s side was always much more of a rowdy, crazy one. My dad has seven brothers and sisters plus their spouses and kids so it was always a large gathering. But it just wasn’t the size that made these Christmas Eves a little wild. Let’s just say my dad’s side likes to have fun. Get the picture? Well on this particular Christmas Eve in 1994 the adults decided that all of the eating, drinking, gift opening, and game playing could wait to start a little later that night. My aunt adopted a family for us to take care of. However, it just wasn’t a deal where we wrapped a few gifts and dropped them off at a church or grocery store with tags on for others to distribute. Rather, we were going to the house ourselves on Christmas Eve to personally deliver the goods. And by goods I don’t mean one present for each member of the family. In addition to a complete Christmas dinner prepared by the Reser Chefs and other miscellaneous groceries added in for good measure, we brought enough gifts to pack Santa’s sleigh. Our Reser group of over twenty people rented a decked out trolley to take us to the west part of Walla Walla County to a very small town called College Place. It was here where the trolley dropped us off at a house that had been converted into apartments. In the corner basement there was an apartment that belonged to our adopted family. We unloaded the trolley with everyone grabbing something. 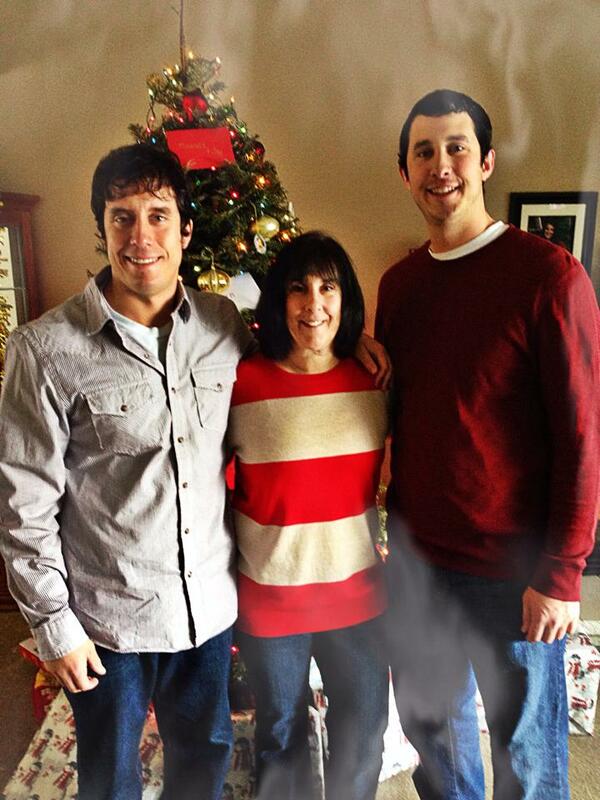 We then tip-toed up to the door, knocked, and waited for the door to open…MERRY CHRISTMAS!!! Overwhelmed was the best word to describe the family. Overwhelmed was also the best word to describe me. To the day I die I will always remember the smell of that house. At that time I didn’t like it. It smelled so strong, so greasy, and so foreign. This evening when I called my dad to talk about this blog post, he just told me it smelled like good Mexican food. You see, we were in the house of a Mexican migrant family. Walla Walla has a high Hispanic population but I didn’t really understand that at eight years old. So while I was shocked by the smell I was also a little shocked by the people I was looking at…people who looked different than me. Also add to the shock factor living quarters that I never realized humans lived in combined with a crying lady and a chaotic scene of almost 30 people smashed into an area meant for maybe four and you bet my eyes were wide open. Yes, the mom was crying. It was probably her way of communicating how thankful she was because they didn’t speak a word of English and we didn’t speak a word of Spanish. I remember a little boy running around with his shirt off the most. I also (although more faintly) remembertwo little daughters roaming the house as well. I remember us giving the little boy Power Ranger figurines. I remember seeing a smile go across the face of the dad. I remember the overall high degree of destitution inside that apartment. Before we left we sang “We Wish You A Merry Christmas” to the family, another one of those vivid memories still lodged in my brain. We then left, boarded the trolley, and went back to the nice warm house of my relatives where we celebrated Christmas Eve. But for the rest of the night I could still smell the scent from our adopted family’s house. That night I learned about poverty, culture, giving and, most importantly, the Christmas Spirit. I thank my Aunt Nancy for adopting that family and giving all of us Resers, especially my siblings and cousins, an experience and an eye-opener that we have not forgotten. Pretty much the best Christmas gift ever if you ask me. Don’t Blink. I decided to start my Christmas shopping early this year as I ventured out this weekend to knock some people off my list. As Missoula’s Southgate Mall was one of the places I risked my sanity to shop in, I noticed some trends inside that shopping center that also corresponded almost exactly to things I observed while zipping through the Spokane malls during Thanksgiving weekend. For today’s blog post I want to highlight the main five trends I have identified inside malls during the 2013 holiday season. Cell Phone Cases Galore: With the proliferation of smart phones comes the proliferation of smart phone cases. The malls I have visited have had at the very least two cell phone case kiosks in high walking traffic areas. People want to protect their phones while also adding a little personality as well. Many of these kiosks sell cases with every design, color, sports team, movie, cartoon character, celebrity, etc. that you could want. However, I feel they are a complete rip off. While shopping for someone on my list I spotted a potential cell phone case that would make a good gift. I asked the person behind the kiosk if I could hold it before I made a decision. He grudgingly allowed me to and the second I placed it in my hands I said “No thanks”. The dingy plastic cover would never protect any phone and the design was not even that cool. Add in the ridiculous price and I would tell most people to not consider purchasing cases from cell phone kiosks in the mall. Seriously, check out www.case-mate.com. There you can personally design your own case while getting a product that will save your phone when you do drop it (just ask me from experience). Gift Cards: While gift cards have been a mainstay in every holiday shopper’s diet for several years now, I feel it has reached a new peak this year. Not only does every store offer gift cards in 10 different designs with 10 different card holders to choose from, but now there is an added incentive to purchase them in high dollar amounts. Every place (no exaggeration) that I have purchased a gift card from has offered me a deal where if I purchase a certain dollar amount I will receive additional funds for free. The most common example is the $100 gift card purchase. If you go to a clothing retailer or restaurant and purchase $100 in gift cards (either on one whole card or say five cards at $20 each), you will get an additional $20 free to either add on to one of the cards or to just slap it on to a brand new card. Obviously you get no complaining from me on this one. What is not to like about going to a popular store and buying a $20 gift card for five of your favorite friends and then getting an extra $20 card for free? You can now give a gift to your sixth favorite friend or if you don’t have that many friends you can keep it for yourself (or maybe give it to charity). I applaud malls for going the extra mile to hire legit looking Santas. Over the years I have seen some cheesy looking Santas with awful looking fake beards and sloppy fitting suits. Obviously the people who take the time and sacrifice to make their actual physical appearance simulate that of the real Santa are going to do the best job and give children the best experience . Samples: This year when I have strolled into malls I have had to ask myself if I was actually in a Costco. Stores and kiosks are giving away samples like never before. Employees with wide smiles holding trays are encouraging shoppers to try their product. **Well, even though I have no intention of buying your meat tray you don’t need to twist my arm to at least taste it for free**. I have watched in semi amazement as the employees handing out samples will rush from their storefront across to the other side to offer customers walking in the opposite direction a bite of their frozen yogurt or a small trial size of their scent. I have never seen the Costco sample ladies do that before! Surprisingly Good Deals: Black Friday is long gone but that hasn’t meant that the good deals are too. I was pleasantly surprised with the numerous bargains I encountered while shopping over the past couple days. Sure, I did see my fair share of jacked up scams but I also saw lots of 40% off sales, $10 long sleeve shirts, and buy one-get one free offers. Anyone who took time and care to investigate what was out there could easily find affordable gift ideas. I also encountered many helpful and cheerful employees who were eager to answer my questions and also point me in the direction of where I could find the biggest savings. While I don’t relish holiday shopping by any means, this weekend it wasn’t too painful. You got roughly nine days of shopping left! Over these never several days when you are out at your local mall don’t be surprised when you notice these particular trends. In fact, I would love it more than anything if you snapped a photo of any mall Santa you happen to stumble across and send it to me. That might be worth a candy cane and a Christmas card from yours truly. Have a great week everyone! Don’t Blink. As someone who loves history and as someone who loves to write out detailed daily records, I take great appreciation in a priceless resource we have available at Grizzly Athletics. While I think I have showed commitment by writing out a thorough summary of every day I have lived for the past fourteen years, I am quickly put to shame by a legend who kept handwritten records on a much larger scale for 43 years. Here is me with the Red Book. It is HUGE. 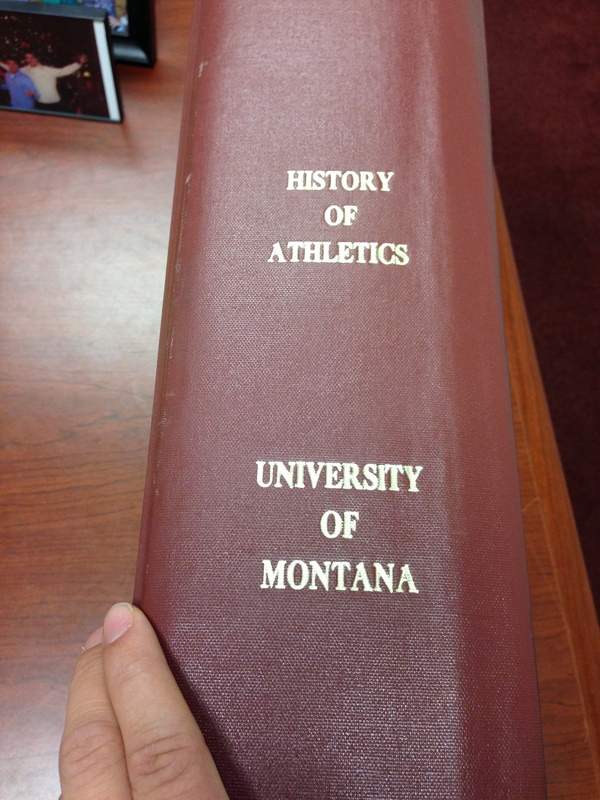 He then went to the end of his office to a book shelf and pulled out the greatest representation of Grizzly Athletics history, the Red Book. Because the thing is so large and weighs so much, I felt some concern as Dave lifted it from the shelf and transported it over to his desk (but he managed just fine). He opened the encyclopedia and investigated the issue at hand. Because of the clarity and the magnificent organization of the book he found the info we were looking for within seconds. The two of us then engaged in a conversation over how remarkable the book is. 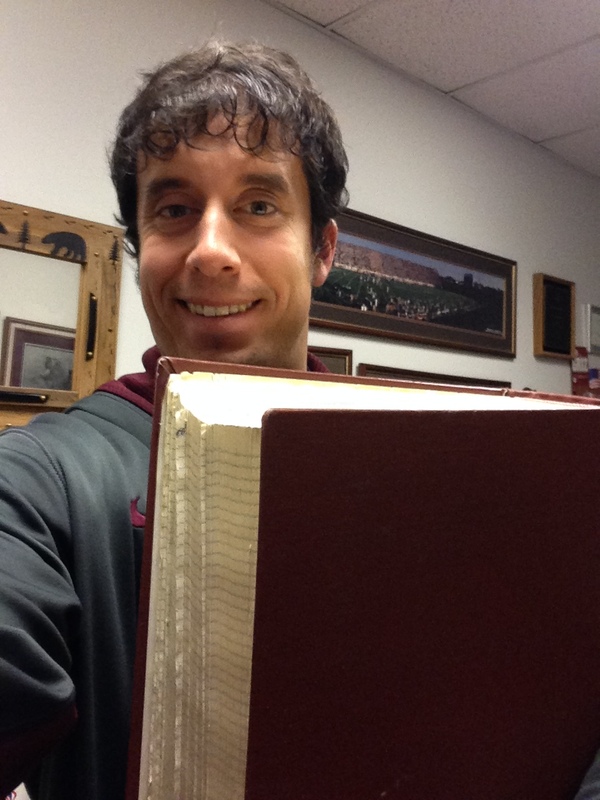 The Red Book is one of the most precious items within Grizzly Athletics. Jiggs Dahlberg was a student-athlete, coach, and athletic director at the University of Montana. He guided the men’s basketball program for many years and holds the school record for most wins. Our basketball arena is named after him. Besides the three roles I mentioned that he held you can also add a fourth: Historian. 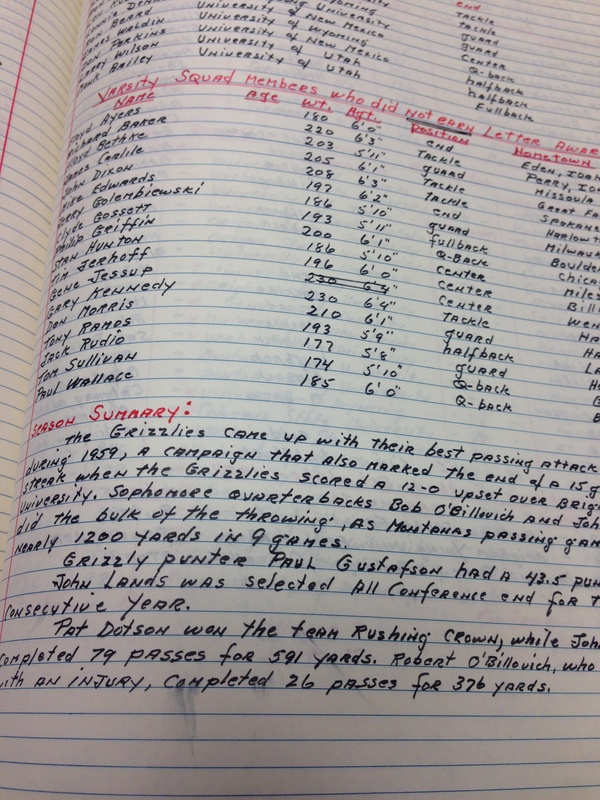 Jiggs Dahlberg filled up around 1,000 pages just like this of Grizzly Athletics history in the Red Book. In 1937, Dahlberg started to write in the Red Book. He reached all the way back to 1897 and started his record keeping there and then updated it all the way through 1937. At thay point he dutifully updated it on a regular basis throughout his whole tenure with Grizzly Athletics and even through retirement, writing his last entry in 1980. As you can see from the image I took below of his last entry, he filled up 963 enormous pages with schedules, stats, rosters, summaries, and more detailing the history of all sports within Grizzly Athletics. In fact, he wrote more than that as at the end of the book you will find “bonus pages” filled with the names of award winners. Jiggs filled up over half the book, as its numbered pages extends past 1,500. Looking at this image you can see the depth that Jiggs went into, even making sure to include the names of squad members who did not letter. As Dave and I talked he had me flip to various spots in the book. He sent me to the page chronicling the 1948-49 men’s basketball team that had a spectacular year. Guff and I got a chuckle out of some of the opponents the Griz played that year as they racked up a couple of wins against AAU teams in midseason. He also turned my attention to some of the season summaries that Jiggs would pen. Brutally honest while at the same time giving credit where credit was due, Dahlberg wrote out a thoughtful and accurate recap of each individual sports season in Grizzly Athletics from 1897 through 1980. 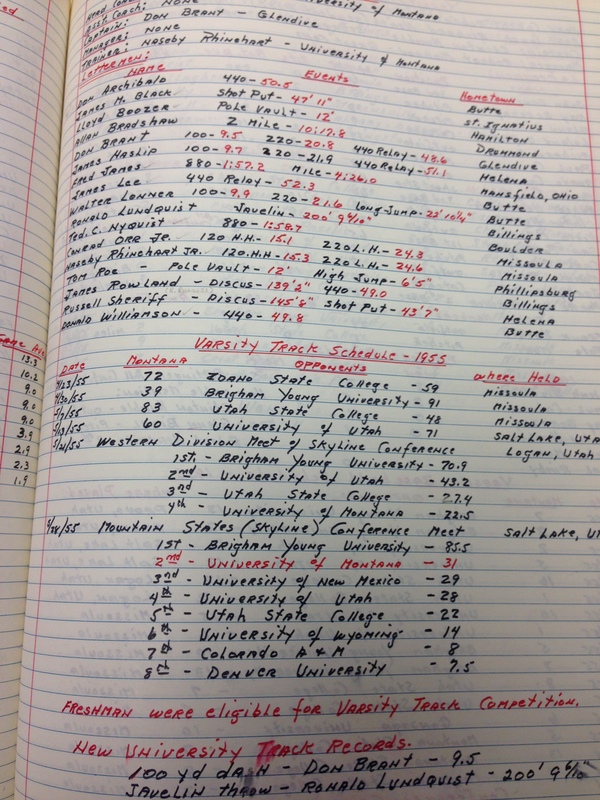 Dave then had me flip to Dahlberg’s last entry where he wrote that at 82 years old, he felt a younger person should take over the duties of recording the history of Grizzly Athletics in the Red Book. As electronic records became dominant in the industry, that younger person never wrote a single word in the Red Book. To this day, every written letter in those pages is from Jiggs Dahlberg. 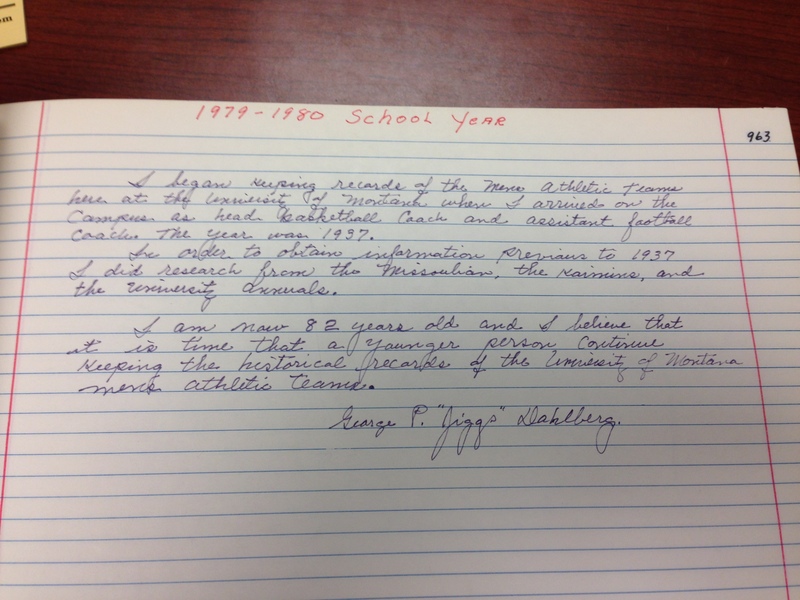 Here is the famous last entry from Jiggs Dahlberg in the Red Book.